At the very splendid finale in London last week Jason Williams of “The Rook” bar in Sydney, Australia, was announced the overall winner of the third annual Beefeater 24 Global Bartender Competition. Williams wins an all-expenses trip to one of Beefeater’s key global markets, where he will have the opportunity to experience the local bartending culture and gain first-hand knowledge of Beefeater’s presence within the international market. 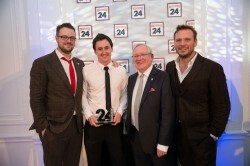 A former Australian Bartender of the Year, Williams beat 25 finalists with his ‘Werewolves of London’ cocktail. 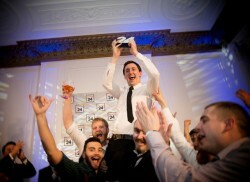 The competition, which is renowned for inspiring bartenders across the globe, attracted more entrants than ever before, with 26 countries taking part including Hong Kong, the USA, Japan and the UK – almost double the number of countries participating in 2012. This year’s judging panel included some of the most revered experts in the industry: New York-based bartender, Jim Meehan, of renowned cocktail den, Please Don’t Tell (PDT); world-renowned mixologist, Tony Conigliaro; leading bars and drinks writer, Lucy Britner; award-winning food writer, Chris Hirst; Head Chef of London restaurant The Rib Room, Ian Rudge and Beefeater Master Distiller, Desmond Payne. Having scrutinised the competing bartenders as they presented their signature Beefeater cocktails and put their creativity to the test in a surprise food pairing round, the judges selected eight overall finalists to go through to the final round, with countries including Ireland, France, Sweden, Finland and the Czech Republic represented. The last round saw the remaining eight contestants tasked with making their cocktail for the guests in attendance at the Grand Finale, with guests then voting for their favourite cocktail. Once the votes were in, the overall scores were calibrated and judges held a final deliberation before Desmond Payne announced Williams as the winner. The standard of the competition was extremely high and almost any of the finalists could have won. At Gintime we were particularly impressed by the drinks made by Denmark’s Hardeep Rehal, 1105 and Jani-Pekka Hiltunen from Finland. The winning cocktail, ‘Werewolves of London’, however was a triumph with its intriguing blend of Beefeater 24 gin, orange and peach liquor, lemon juice and frankincense bitters, finished off with a green tea mist.